The information provided on this website is provided on an "as is" and "as available" basis for purely general information purposes only. The SCD Govt. College Ludhiana endeavours to keep the information up to date and correct, it makes no representations or warranties of any kind, express or implied, about the completeness, accuracy, reliability, suitability or availability with respect to the website or the information, services, or related graphics contained on the website for any purpose. Any reliance you place on such information is therefore strictly at your own risk. 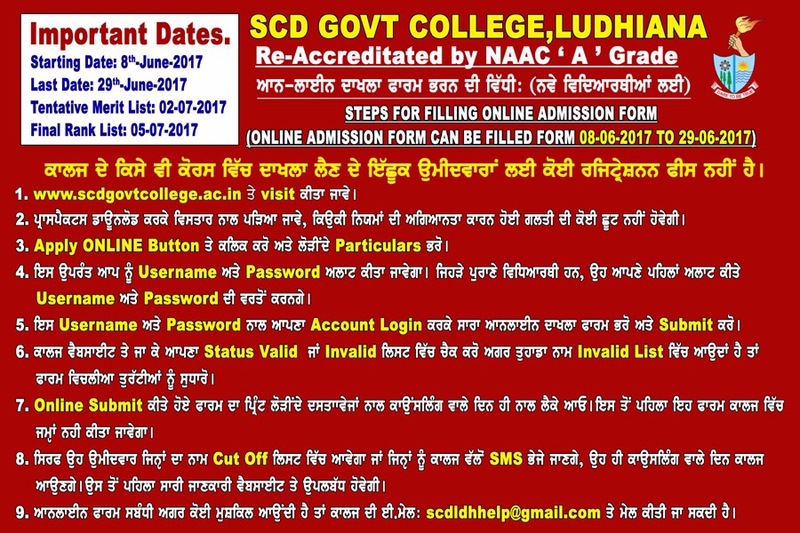 You are advised to verify the same from the office of SCD Government College, Ludhiana. The information provided on the website cannot be used for legal purpose. Any dispute arising out of the information provided on website has no meaning and is subjected to the jurisdiction of Ludhiana. Every effort is made to keep the website up and running smoothly. However, SCD Govt College Ludhiana takes no responsibility for, and will not be liable for, the website being temporarily unavailable due to technical issues beyond our control. The college does not warrant that sites will operate in an uninterrupted or error-free or virus free manner. If you see something in a website that needs correction or updation in webpage, please send e-mail to scdldhhelp@gmail.com. SCD Government College reserves the right to change the information published on this site at any point of time without further notification. In no event will college be liable for any loss or damage including without limitation, indirect or consequential loss or damage, or any loss or damage whatsoever arising from loss of data or anything else whatsoever arising out of, or in connection with, the use of this website. This website also contains links to other internet sites. The inclusion of any links does not necessarily imply a recommendation or endorse the views expressed within them. Such links are provided as an information service for the convenience of users of this website to provide further information. SCD Government College has no control over the nature, content and availability of those sites, hence SCD Government College would not be held responsible or liable for any content or material on such sites.